What is the Bearded Oysters? 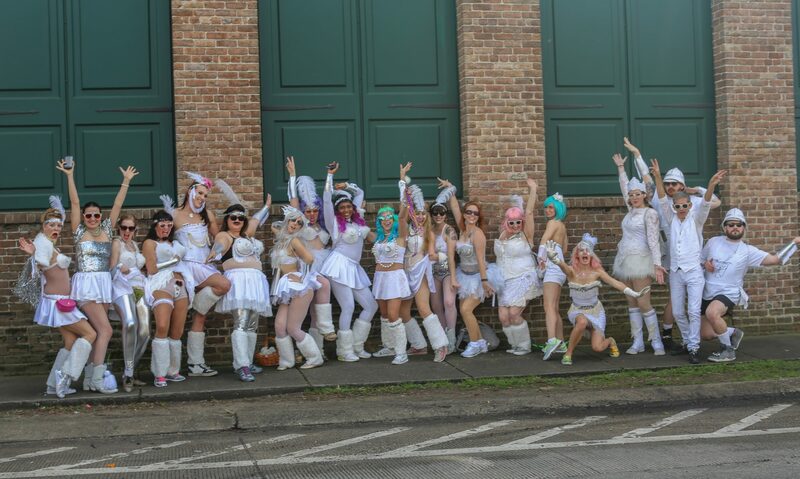 The Bearded Oysters is a parade organization devoted to sisterhood, fun, art and personal growth. Over 850 women and men have participated throughout the years. The Bearded Oysters have performed in hundreds of parades in New Orleans, Baton Rouge and New York City as well as on television and film. They have certainly proven that the world is their oyster since their first parade in 2004. How do I become a Bearded Oyster? You can join now by purchasing your membership on the Join Us page. After you purchase, you will receive an email from the Mother Shucker on how you would like to receive your uniform. You can pick it up or have it mailed to you. You will be asked to provide some of your sizes so that there can be an array of choices available to you to try on. It usually takes about a week for the uniforms to be made for your choosing. When is a good time to join Bearded Oysters? Anytime. Bearded Oysters have opportunities to parade throughout the year. Carnival is considered by most to be the height of our year. Although many members have benefitted from doing some practice parades before the big parades of Carnival. Some years we have been unable to meet demand for uniforms in the weeks before Carnival, so please plan a couple weeks out if possible. Who is the typical Bearded Oyster member? The similarities among the Bearded Oysters are their love of fun and parading including getting attention, crafting, costuming, revelling and spreading smiles with their many creative talents. Women of all ages, backgrounds and paths have found friendship, personal growth and a schuck-load of fun while marching with us. We have members from ages 21-70+ years old and believe this diversity is what makes us the best krewe for all ages. Women of all sizes are included in our troupe. What do we do during a parade? Parades offer an opportunity for you to share your talents with an enthusiastic audience. The parade route is an excellent place to dance, hula hoop, ribbon twirl, juggle, blow bubbles or hand out throws. Smile, wave and pose for photographs with the crowd. Enjoy laughing, dancing and strutting with old and new friends. Experiment with performance arts such as burlesque, improvisation, puppetry, street theatre, comedy and dance. What shouldn’t we be doing in the parades? Disengaging from the audience. Parading is about sharing love and fun with others in the audience. That means be emotionally and performatively available to the crowd at all times. Smile at the audience, not into your FaceTime or selfie stick. You are the show and that is the most fun you can imagine. Maintain sobriety for your own good. While a popular concept, being super fucked up in a parade is a bad idea. Many paraders have ended up in the hospital from walking into things, getting run over by floats and vehicles, twisting ankles, tripping on beads, getting hit in the face with beads and so on. Its understandable to feel some stage fright and want to drink it away, but when you see your sloppy self all over the internet looking disgusting, you might really regret it. There are also police every couple of feet all the way down the parade route and if they think you look too messed up to be walking by 1000s of kids, they will pull you out. And… No Smoking, No Glass, No Drugs, No Sexual Harassment, No Body Shaming and No treating others with rudeness. Parades vary in length. Some can be as short as a mile while others are up to 5 miles. Parades can take from 1-5 hours. How long have the Bearded Oysters been parading? The Bearded Oysters began with 40 members in August, 2004 for the Krewe of OAK Midsummer Mardi Gras Parade. The Bearded Oysters have participated in hundreds of parades and events as well as television commercials and film. Who can be a Bearded Oyster? Any woman over 21 can become a Bearded Oyster. You define your own gender. Special permission for those under 21 can be given if they are accompanied by an older member. Can men be Bearded Oysters? Yes. Check out our page for Men. How can I participate between parades? As a Bearded Oyster, there is always something you could be doing to advance yourself and the troupe. Making a connection with a neighborhood oyster restaurant is a good start. Restaurants are typically psyched to give you their discarded oyster shells for decorating. Oysters can be fun to decorate with friends and sometimes even with children. If you are feeling crafty, but painting isn’t your thing, you could elaborate your uniform. It is fun to decorate a pair of sneakers with tinsel, spray paint, glitter, costume jewelry and more. Adding fringe or a feather boa to your skirt is an easy hand-sewing project for a lazy afternoon. If you are feeling social, get on our Facebook page and round up some fellow Oysters for a good time. Plan a tubing trip, a spa day, a luncheon, a stilt walking practice, build a small float…the world is your oyster. No. You are welcome to make or purchase throws however, it is not necessary. If you choose to pass out throws, please be respectful to Mother Earth with your choices. A great, cheap throw is decorated oyster shells. Boil some oyster shells, let them dry and get creative with markers, glitter, collage, etc. The streets will be covered in brand new beads along the parade routes. Its easiest to just pick up beads and toss them to the crowd. That way you don’t have to carry heavy beads too. During choreographed performances their is not usually time to give out throws. Yes and No. We never have mandatory group rehearsals. However, The Pearls, our leading ladies, hold optional rehearsals for special events and TV/Film appearances. Typically dance numbers are simple enough to learn and master in about an hour as we care more about energy and vibrance than tight choreography. For big parades we bring out our isis wings and perform a very simple choreography that you can check out here. What if the weather is cold? Winter parades can be very cold, in the past temperatures have been as low as 30 degrees. Your enjoyment depends greatly on dressing appropriately for the weather. Wigs, layered nylons, leggings, hats, scarves, long underwear, coats, etc can be worn under and over your costumes. Wigs can be any color, but please wear white, grey and silver clothing to match your uniform. Hand-warmers can save the day, but nothing beats staying together and dancing. What if the weather is hot? Summer parades can be dangerously hot. Feel free to shed uniform pieces as needed. Wigs can get very hot. Stay hydrated. Parasols are a great way to protect yourself from the sun while elaborating your parade attire. Parades typically do not roll in the rain. Most rained out parades will be rescheduled. If a parade is cancelled it will be announced on the local news. Do I have to wear a beard? Yes. Bearded Oysters wear beards (or mustaches at least). Don’t be scared, embrace it, its part of the fun. There are endless options from a big, bushy beard to smaller drawn ones. Lovely ladies have used fringe, glitter, rhinestones and makeup to create magnificent beards. Can I alter my costume? Yes. You are welcome to display your creativity with your uniform. Please follow these rules though. You may add to your uniform how you like with our colors of silver and white. Merkins do not need to be silver and white, they can be any color. Please wear sneakers or comfortable shoes when parading. Your fur leg-warmers will cover most of the shoe. The streets are often uneven and go-go boots and heels can prove dangerous. A merkin is a pubic hair wig. Many Bearded Oysters choose to wear one to enjoy the attention they receive when they lift their skirts for the audience. You can wear one if you want. Bearded Oysters cost between $200-$375 depending on what membership level you purchase. Membership is a one time purchase. Once in a while, events cost additional money to cover costs. In the past, this has been for Muses parade and was $100. Flapper headbands should not be cleaned. Do not wet your feather. You can wipe the sequence with a wet cloth. Mardi Bra can be wiped clean with a damp cloth and pat dry. Skirts can be cold water washed. Use stain remove stains. Steam or low-iron. Spandex sleeves can be soaked in soapy/detergent water, rinsed and hung to dry. White fur legwarmers and stole can be machine washed. Spray liberally with stain remover where needed. Wash with cold water and fluff (regular heat) in dryer or hang dry. What if I lose or ruin a uniform piece? Lost or damaged pieces can be repaired or repurchased through the Mother Shucker. Am I too big to fit in the costume? No. You are just fine no matter what your size is to be a Bearded Oyster. You can customize your uniform with costume pieces that work for you. If you need a bigger bra, we have some, or we can work with you to decorate a bra or top you feel comfortable wearing. Same is true for all elements of our costume. We have had many bigger women join us and we are committed to keeping our troupe body positive for all. Do I have to live in New Orleans to be a Bearded Oyster? No. Bearded Oysters can be from anywhere and are welcome to participate when they visit. What do the Bearded Oysters do other than parade? Recently, the Bearded Oysters have been cast in several television shows, movies and a national commercial. In addition to that, the Bearded Oysters often participate in social movements and art events throughout New Orleans. Who founded the Bearded Oysters? Mother Shucker and Founder, Karina Nathan aka “Katrina Brees” founded the troupe in 2004. Brees is well known for her many Carnival contributions including her Mardi Bras and developing green alternatives to Mardi Gras beads. In 2011, Brees founded the Krewe of Kolossos to showcase her eco-friendly papier mache floats powered by tricycles. Katrina’s newest artistic practice is her ego-friendly Fantastic Caskets.